The following document is intended as a first draft to kick off a discussion of a network of marine protected areas for the Hauraki Gulf. It was prepared late in 2014 for the Biodiversity and Biosecurity Round Table of the Marine Spatial Planning process, but there was little time for discussion within the group. It was sent on to the Stakeholder Working Group for further discussion. SEASKETCH DRAFT MPAs NETWORK, SITE DESCRIPTIONS. 12 Dec 2014 update Roger Grace. For consideration by the Biodiversity and Biosecurity Round Table of the Marine Spatial Planning process for the HGMP. 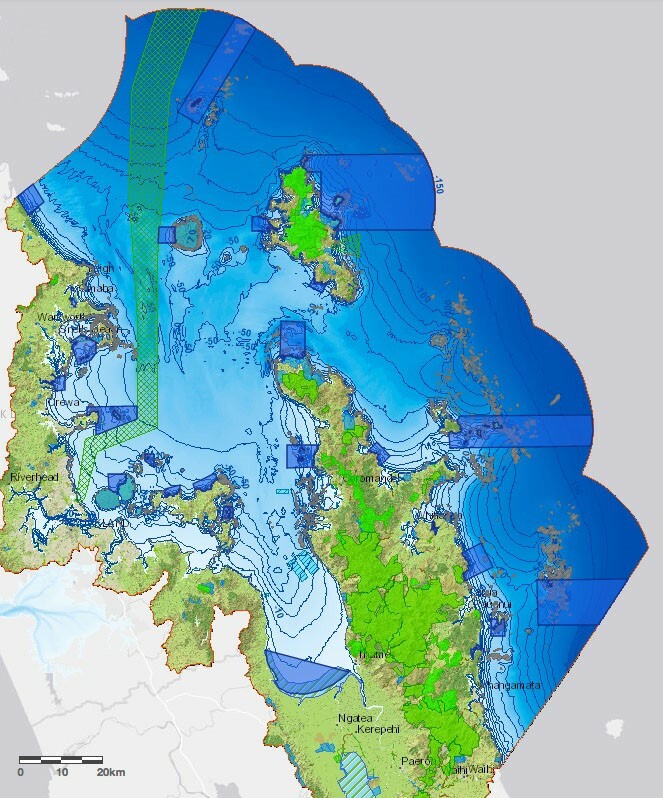 Draft Type 1 MPA network for the Hauraki Gulf Marine Park. Two successive State of our Gulf reports to the Hauraki Gulf Forum (HGF 2011, 2014) have shown that many indicators for the environmental health of the Hauraki Gulf are in serious decline. The 2011 report was a catalyst for a response by Auckland Council, Waikato Regional Council, Department of Conservation and Ministry of Primary Industries to sponsor a Marine Spatial Planning Process to address a multitude of terrestrial and marine issues which are known to influence the ecological health of the Gulf. One of the serious issues the Gulf has suffered is loss of biodiversity in its many forms. MPAs or Marine Protected Areas can be effective tools for protection of marine biodiversity. Particularly Type 1 MPAs, in New Zealand known as Marine Reserves established under the Marine Reserves Act 1971, are known to be very effective at allowing marine life and habitats to recover from many years of degradation caused through fishing pressure, loss of ecosystem services and resulting trophic cascades. The New Zealand Biodiversity Strategy (DOC 2000) aims to maintain marine habitats and ecosystems in a healthy functioning state, and to allow degraded areas to recover. The aim is to have 10% of NZ’s marine environment with some form of protection effective for biodiversity. The Marine Protected Areas Policy and Implementation Plan (DOC & Ministry of Fisheries 2005) will be a key means of achieving this. An effective network of MPAs for the Hauraki Gulf Marine Park must have as its core a series of Type 1 MPAs or marine reserves. Lesser levels of protection in Type 2 MPAs can be seen as supplementary to the core network of no-take marine reserves. The MPA network proposed is just one, but a very important one, of the processes which can lead to an improvement in the environmental health of the Hauraki Gulf. It will definitely lead to greatly improved ecological health in the approximately 10% of the HGMP targeted, and the benefits of these improvements can spill over into other areas. Larger MPAs will also allow restoration of natural population structure of exploited species, including large old fish much reduced in fished areas, which provide different ecological services from small fish. But what of the other 90%? There are many opportunities for substantial adjustments in management of fisheries which can lead to environmental improvements, including reduction in bottom-impacting fishing techniques, and increase in the standing biomass (eg. doubling) of many commercial and recreational species thus reducing the impact of trophic cascades. Decrease in sediment and nutrient runoff from the surrounding catchment is also seen as critical to an improvement in overall health of the Gulf. All these moves need to progress together in order to not only arrest the decline of the Gulf, but to turn it around and to head towards an improvement in key environmental indicators. Indicative Areas of Commercial Scallop Dredging. Presentations to the Biodiversity and Biosecurity Round Table have also been very helpful, as well as discussions with other Round Table members. A common theme in the results from the public Listening Posts held early in the MSP process was a clear desire for more marine reserves. A parallel result came from an Auckland Council People’s Panel survey recently in which, in the last 12 months, 39% of respondents had visited a marine reserve in Auckland, whereas only 24% had fished in the ocean. These results suggest that the MSP process has a clear mandate to recommend creation of more marine reserves. Type 1 MPAs, or no-take Marine Reserves, are the top protection class of MPAs and offer the best protection for biodiversity that we can provide. We have a few long-established Type 1 MPAs which prove the value of total protection and the increase in value of these areas through time. Because this protection is the best we can offer, there is no option to adjust restrictions so in theory there is no need from a management point of view to monitor these MPAs extensively, in contrast to partial protection (Type 2 MPAs) where monitoring is required to test the effectiveness of variable controls imposed and allow adjustment if necessary. REPRESENTATION. All marine habitats in the HGMP should be represented in the network. REPLICATION. There should be more than one example of each habitat represented in the network to safeguard against accidental compromise and loss of a habitat type. NETWORK DESIGN. The network should be designed with connectivity in mind, so that marine life has a chance to use the protected areas as “stepping stones” from one sanctuary to the next. PERMANENT. The MPAs should be permanent. They increase in biodiversity value as time progresses and should be allowed to continue this process toward maximum value. SUFFICIENT QUANTITY. There should be enough MPAs and of sufficient size for the network to be self-sustainable and viable. In this case a loose goal of around 10% of the area of the HGMP in Type 1 MPAs has been the target, which is compatible with the goal for the Territorial Sea as set out in the NZ Biodiversity Strategy 2000, but is minimal in terms of modern international goals (20 to 40%, Thomas & Shears 2013). Currently we have six marine reserves in the HGMP totaling only 0.3% of its area. Where possible a coastline length of at least 5 kilometres should be included in the MPA. For connectivity, similar habitats in representative MPAs should be preferably less than, and not much more than 50 kilometres apart. Boundaries should be kept simple, with straight lines preferable to a distance-off line. Where possible boundaries should follow north-south or east-west orientation. Final boundaries should take account of ease of sighting using obvious land marks where possible. For coastal reserves, inclusion of accessible coastline is desirable for ease of public access. Where possible reserve boundaries should not cut through rocky reefs, but should include the entire edge of a reef, preferably with a buffer of soft sediment around each reef system. Aim for a low boundary to area ratio – “chunky” rather than long and skinny – to minimize edge effects. Because of the “edge effect” caused by fishing on the boundaries of a reserve, large reserves are more effective at biodiversity protection than small reserves, and especially so for mobile fish species. Because of conflict with other uses, particularly recreational fishing, it will be difficult to achieve large reserves close to population centres. Proposed larger reserves are therefore generally confined to the outer Gulf and areas remote from centres of population. In most cases the boundaries shown on the accompanying maps are indicative only, and subject to discussion and adjustment to best suit biodiversity goals, habitat capture, and social or cultural aspirations. Although it is desirable to minimize conflict, often top fishing spots coincide with the best biodiversity hot spots, so in some cases compromises will have to be made. In preparing this draft allowance for biodiversity values has generally taken priority at this stage, though other factors have been taken into account where possible. 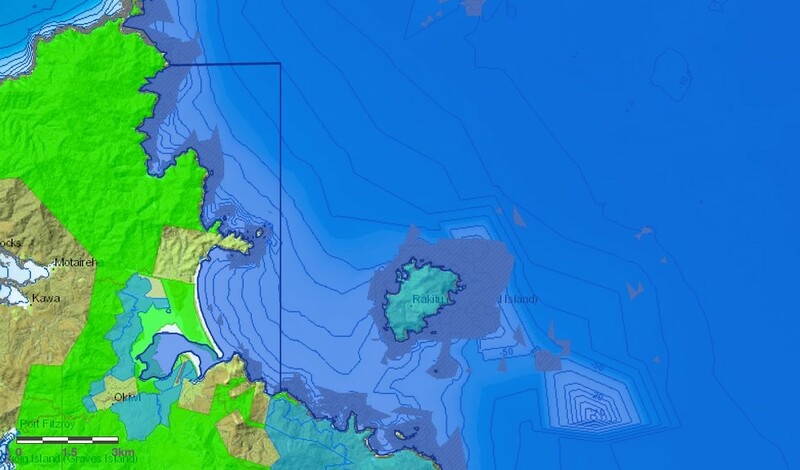 In some cases it may be appropriate to create Type 2 MPAs, particularly Mataitai, surrounding or adjacent to the proposed Type 1 MPAs. In this early draft little attention has been given to this concept, but development of the idea is encouraged. When viewing these draft MPA maps in Seasketch, it is desirable to have the bathymetry contours and rocky reef attributes switched on. Exposed sandy beach. About 5km of beach, either north or south of Te Arai depending on local criteria. Probably not including the rocky reefs of Te Arai. Out to about 5km offshore. This habitat is represented in MPAs only at Tawharanui in the HGMP, and then a much smaller area and less exposed. There is a complication of sand mining close to shore but possibly this may be phased out in a few years. There may also be an overlapping large offshore sand extraction license area. Several reports and good biological survey information is available. There are shelly areas offshore. 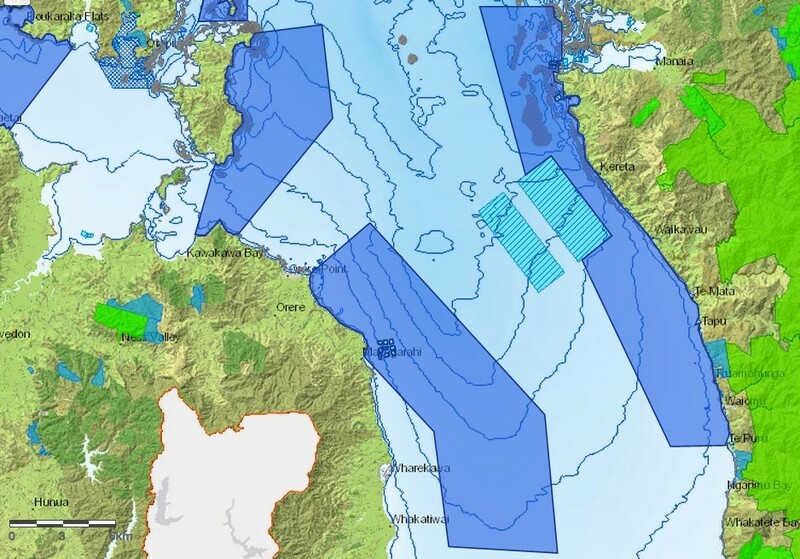 Technically the cable protection zone running through the Hauraki Gulf from Takapuna Beach to the edge of the Territorial Sea north of the Mokohinau Islands is effectively fully protected, as no fishing or anchoring is allowed. The suggestion here is to upgrade the Cable Protection Zone to a full Type1 MPA to formalize its biodiversity protection role as to some extent it has already been serving that function incidental to its cable protection function. Making it an MPA is likely to improve compliance particularly with recreational fishers. The zone protects a wide range and considerable area of soft-bottom benthic habitats from shallow water to depths in excess of 150 metres, many of which are poorly represented elsewhere in the proposed MPA network. The zone also includes some low-level reef habitat northwest of Little Barrier Island, and incidentally contains the wreck of the Niagara. It would also provide a large area for recovery of pelagic fish species. Whangateau HarbourCare Group has since 2009 had plans for a Scientific Reserve in the southern arm of the harbour (Waikokopu Creek), extending the existing Omaha Taniko Wetlands Scientific Reserve (kahikatea forest) down to the low tide mark. The area is a rich mosaic of saltmarsh, mangroves, seagrass, firm sand flats and rare coralline turf “rhodolith” balls. Concept of Scientific Reserve rather than Marine Reserve is to allow future manipulation of small mangroves if they spread to compromise the open sand flats valuable to wading birds in the area. 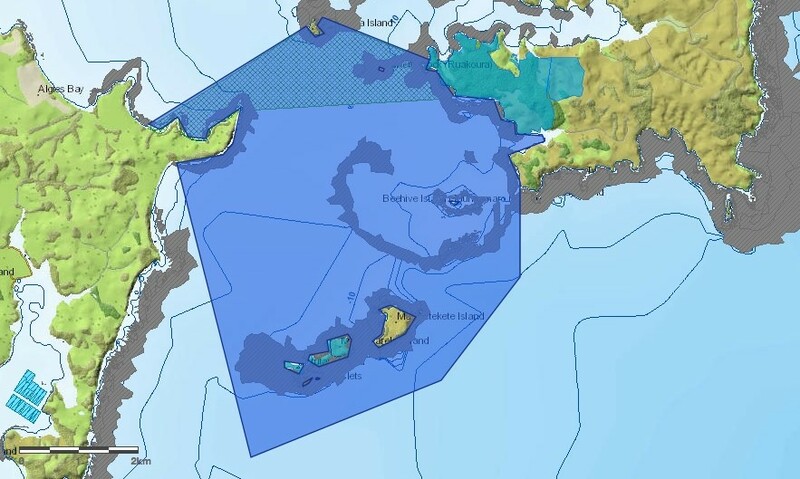 The existing cable zone prohibiting fishing is used as the basis for a no-take MPA and extended to include Beehive Island, Motuketekete and Moturekareka. Rich diversity of soft substrates including shell-gravel current swept areas. Steep rocky reefs drop down the south side of the islands. Beehive Island is a gem with a wide intertidal rock platform with high educational value. Beds of rhodoliths are known in the area. A recreational scallop bed may be contentious but it would be good to have at least one protected in the Gulf. Shore access at Martins Bay and Scandrett’s Regional Park. Some detailed habitat information in Chiaroni et. al. 2008. This reserve is adjacent to three Regional Parks – Wenderholm, Mahurangi West, and the newly acquired Te Muri. There is no road access to Te Muri. Two estuaries are included – Puhoi River and the much smaller Te Muri estuary, both supporting appropriate quantities of mangroves and salt marsh habitat. The shoreline is moderately sheltered sand stone and mudstone strata. Shallow reefs drop to muddy fine sand close to shore, though there is the isolated Brazier Rock exposed off Wenderholm with extensive submerged rock reef. At the north the entrance to Mahurangi Harbour probably supports horse mussel beds important for juvenile fish. Two sandy beaches are included. Wenderholm is one of the most popular Auckland Regional Parks. Mid-north Forest and Bird was interested in a marine reserve in this general area about 15 years ago. A lovingly restored wildlife sanctuary on land, some people believe a similar status would be appropriate around the island and its reefs, to foster the ecological connection between the sea and the land. Hard greywacke rocky shores surround the island, and extend offshore as a series of submerged reefs and emergent rocks. The area is heavily fished recreationally, and kina barrens are extensive (Grace 2014, p 47) where rich kelp forests bristled with crayfish in the 1960’s. Hapuku were caught here up to 1945. Strong currents particularly through the Tiritiri Passage flow over shell gravel beds with high biodiversity value, and where currents pass over reefs the benthic life is particularly rich and colourful. Extending the reserve to include the intertidal and shallow subtidal sandstone reefs north of Army Bay would provide access to the reserve for land-based visitors. Huge rock pools in this area would be wonderful snorkeling sites for families and kids, and a marine reserve would give them something exciting to see. Currently shallow reefs in this area are severely degraded extensive kina barrens (Grace 2014). The New Zealand Underwater Association prepared a public discussion document on three options for a marine reserve in this area in December 2002 (NZUA 2002 – document available). Although receiving considerable support, the idea was severely and vocally “hounded down” by the recreational fishing fraternity. There is a major treated sewage outfall off the end of the Whangaparaoa Peninsula discharging high-grade effluent to a subtidal outfall in the Tiritiri Passage, but an existing outfall can be accommodated in a proposed marine reserve. 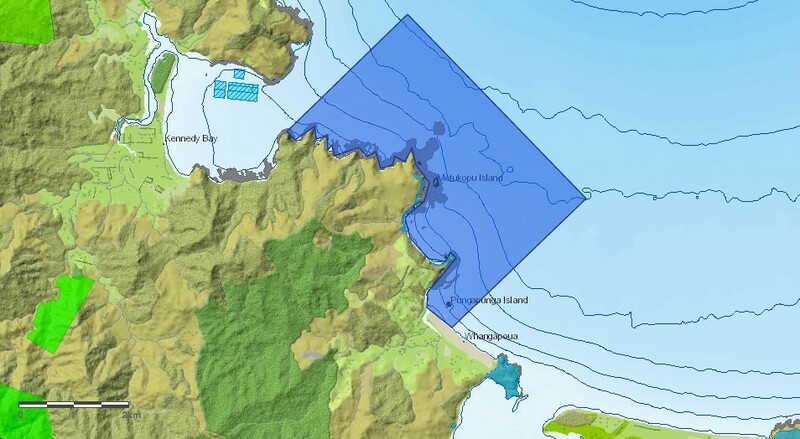 The shape of the proposed reserve in this instance is partly controlled by the idea of joining it up to the cable protection zone which passes a short distance to the south and east of Tiritiri Matangi, thus substantially increasing its effective size and biodiversity benefit. Iconic Rangitoto Island with its rugged basalt lava fields contrasts geologically with the mudstone and sandstone layered rocks of Motutapu, and underwater the habitat provided by these two rock types would be quite different. Capturing these two contrasting shores and underwater habitats within one MPA would be a unique opportunity for biodiversity protection. Kina barrens are prominent on the Rangitoto reefs (Nick Shears, pers. comm.). A few islands and reefs off Motutapu extend offshore, but the reefs drop quickly on to a muddy bottom. Halfway along the Motutapu shore is the Motutapu Outdoor Education Centre, which puts hundreds of kids through environmental and educational courses each year, with an emphasis on marine activities. There is also an enormous revegetation project underway on the island. The presence of a marine reserve in this area would be a great boost to their activities. They already support a small voluntary reserve area where snapper numbers have increased. The multitude of small islands and reefs in this area ensures it is a very popular small boat-based fishing spot and attempts to create a no-take MPA in this area will run into stiff opposition from recreational fishers. I believe there is room, however, for both a fishing zone and a no-take area. The high biodiversity values of the hard greywacke shores and reefs deserve to be recognized in a no-take MPA covering approximately half of the area of reefs and islands. Kina barrens are prominent in the area. Subtidally the coastal reefs drop to a sloping seabed of broken shell debris with high biodiversity value, and eventually down to flatter mud-dominated areas. Part of the protected area should include at least one of the islands where visitors can base snorkeling activities on the small gravel beaches. Placement of the boundary will require a lot of public input and discussion. Illustrated is just one option. 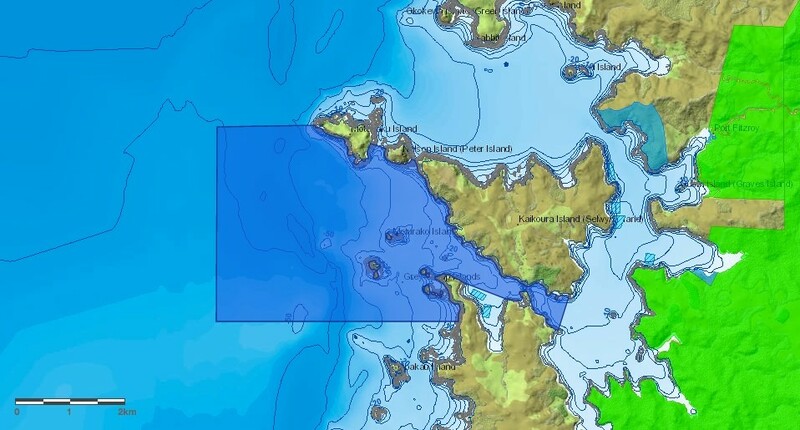 There has already been a lot of public discussion about a no-take MPA on the north side of Waiheke, with a proposal near the populated residential area sparking fierce debate. From a biodiversity recovery point of view there is merit in an MPA somewhere along the northern coast of Waiheke. Surveys have shown severe degradation of shallow reef systems in places, with serious kina barrens from low tide down across the reefs to the sand (Grace 2014, p 48 & 49). The semi-sheltered nature of the coast provides habitat dominated by tangle-weed forest (Carpophyllum flexuosum) with a lesser occurrence of the common kelp Ecklonia radiata. In many places large numbers of kina are actively eating the algal forest leading to further expansion of kina barrens. Crayfish and fish populations are severely depressed through heavy fishing pressure. Further public discussion will be required to refine ideas on where a suitable site may be. I have illustrated two potential alternatives on the map (Waiheke West and Waiheke East). Waiheke is heavily populated in the west where long term the public benefits of recovery in a marine reserve could be appreciated by more people, but at the same time more people would be prevented from fishing. Towards the east sparse human population means fewer people would be adversely affected, but the public benefits would also be more difficult to access. From a biodiversity point of view it appears there is more degradation in the west than east so the biodiversity recovery benefits of an MPA could be greater toward the west. Habitat information can be found in Kerr and Grace (2013). Only 5 kilometres from the existing Te Matuku marine reserve, Rotoroa Island has some of the same habitats but also different ones. Sheltered inshore reefs mostly drop quickly on to sand and shelly sand bottom, though on the more exposed eastern side a few deeper reefs occur. Algal forests are likely to be dominated by tangle weed Carpophyllum flexuosum. The Rotoroa Island Restoration Trust has a huge restoration project underway on the island. A marine reserve is seen as an appropriate way to restore the inter-connection between the land and sea aspects of the ecology. The Revive Our Gulf group is using the shallow sandy seabed around the island as a trial site for restoring beds of green lipped mussels. Historically there were 500 square kilometres of natural mussel beds in the Firth of Thames and southern Hauraki Gulf which filtered the water of the Firth in one or two days. The mussels were dredged out commercially in the early half of last century and their water-cleansing ecological service has been lost. The RoG group has a vision of restoring substantial areas of mussels to recover some of the water filtering capacity and improve water quality. A unique part of the Hauraki Gulf, the Miranda coast and southern Firth of Thames is renowned mainly for its importance as a local and international migratory shore-bird feeding, breeding (for some species) and roosting area. A large area in the southern Firth is a RAMSAR site, internationally recognized for its value to avian life. Although water quality is severely compromised by sediment and nutrient inflows from the Waihou and Piako Rivers, and mangroves are expanding rampantly in the southern Firth, the area represents a marine habitat very different from any elsewhere in the HGMP and warrants an MPA on these grounds. The boundaries of the area will be determined by discussions with local communities and a consideration of ecological values. The Miranda coast has unique shell-bank features, and further south extensive intertidal mudflats are rich feeding areas for wading birds. A Scientific Reserve may be appropriate for the intertidal areas as there may be a need to manipulate mangrove spread to maintain open areas for the birds to feed, but a Marine Reserve would be appropriate in the subtidal area. Very different from any other island group in the HGMP, the multitude of islands off the west coast of the Coromandel Peninsula need representation in the network of MPA’s. The complex of islands and reefs, shallow and deep water, currents and more sheltered areas, ensures a wide range of biodiversity within the suggested boundaries of a no-take MPA. Inclusion of a length of mainland coastline completes the mix and provides access to land-based visitors. This MPA would be extremely biodiverse and a great asset to the MPA network. Although this is a popular recreational fishing area, there is plenty of room for fishing zones as well as a substantial no-take MPA. 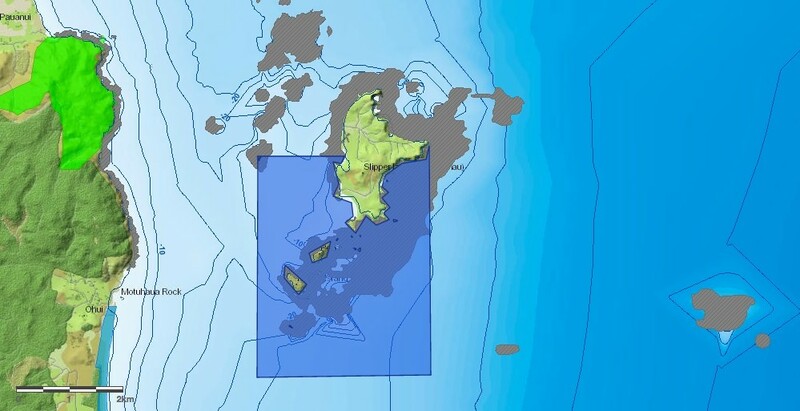 The northernmost in a series of deeper-water MPA’s proposed based on the outer islands on the eastern edge of the HGMP. The Mokohinau Islands are 50 kilometres south of the Poor Knights Islands marine reserve, satisfactory for practical connectivity between marine reserves in the network. The Mokohinau Islands are “downstream” of the Poor Knights within the influence of the East Auckland Current which provides a strong subtropical flavour to marine biodiversity. The biodiversity values of the Mokohinau Islands are very high both in the terrestrial and marine environment. Although this is a very popular fishing area, there is sufficient space here to accommodate a fairly large MPA as well as providing for continuing fishing. Deep rocky reefs extend down to over 100 metres and are likely to contain good habitat for hapuku, deep water corals and ancient glass sponges. Extending the MPA to the edge of the HGMP captures extensive rocky reefs below 150 metres, rare within the Park and likely to be extremely rich in biodiversity. These reefs could provide an opportunity for recovery of hapuku populations. A large area of open water around the islands will provide sufficient space to allow recovery of snapper to a natural population structure, as well as spectacular recovery of school fish like trevally and kahawai. This is essentially a resurrection of the Aotea marine reserve proposed by the Department of Conservation in January 2003 (DOC 2003), but with a small adjustment to accommodate one of the major reasons why, following approval by the Minister of Conservation, the reserve was finally turned down by the Minister of Fisheries. The local iwi was apparently unwilling to give up the coastal fisheries from the Needles to Waikaro Point opposite Arid (Rakitu) Island. 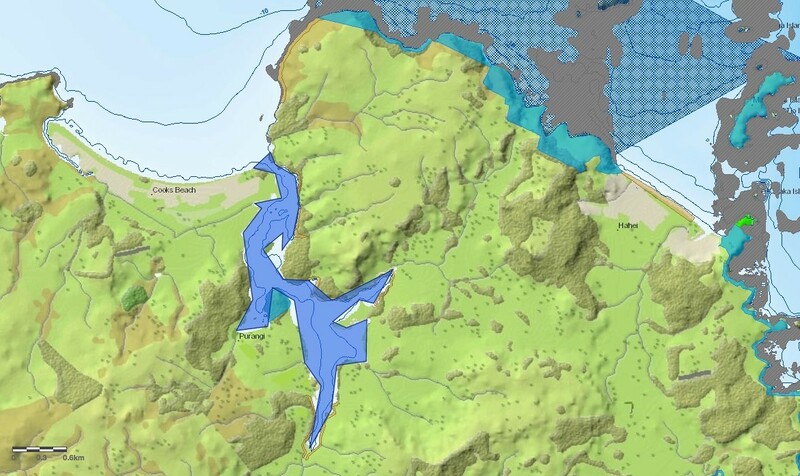 This proposal suggests a mataitai reserve along the shore from south of the Needles to Waikaro Point, and further south including the Whangapaoa estuary and some of the shore west of Harataonga Bay. 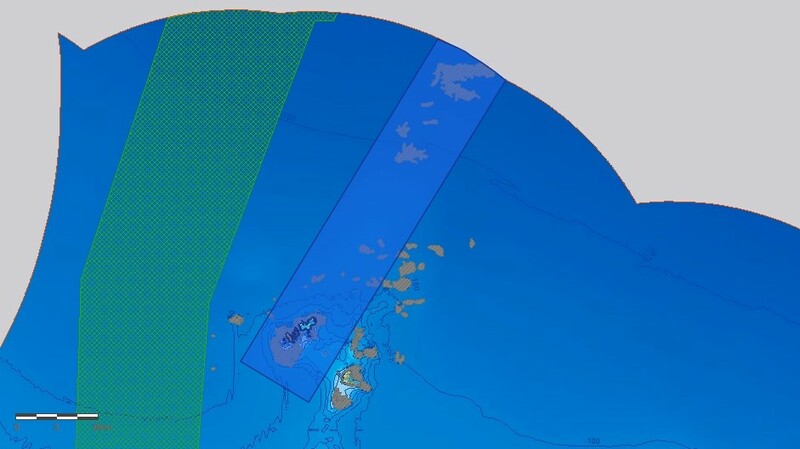 East of this line the no-take MPA would extend out to the limit of the territorial sea, as in the 2003 discussion document (document available). Technical information collated is still relevant, and documents the marine habitats contained within the proposal area. Apart from the clear high-value coastal habitats, of particular note is a series of three large deep water reefs across the northern area of the proposal, ranging from a depth of 70 metres to approximately 150 metres. ROV footage showed these reefs to support high biodiversity value habitats containing black coral, gorgonian corals and ancient glass sponges. This habitat could be particularly valuable for recovery of hapuku populations. The large area of open water would also support the recovery of snapper to a full natural population structure, and recovery of school fish such as trevally and kahawai, and possibly kingfish. The area includes a large swathe of deep muddy sediment habitat not well represented elsewhere in the MPA network. The area near the Broken Islands west of Port Fitzroy, and part of the deeper Craddock Channel between Great and Little Barrier Islands, contains habitats unique in the HGMP and warrants a no-take MPA somewhere in this area. Further investigation of habitat information, and discussions with the local community, would be required to refine a proposal and boundary locations. There is a lot of mussel farming activity in the area, and considerable opportunity for Mataitai or similar Type 2 MPA areas perhaps nested around a central Type 1 MPA. The area suggested for a Type 1 MPA is south of Kaikoura Island, but is just one of many possibilities. It has also been suggested that a second area nearer Tryphena inlet (Amodeo Rocks) further south could be considered. Although Little Barrier is a seriously popular fishing area and there are commercial and recreational scallop fisheries present, the biodiversity values and different habitats of the area and connectivity with the very high conservation status of the land suggest that there should be room for a small no-take MPA adjacent to the Island. 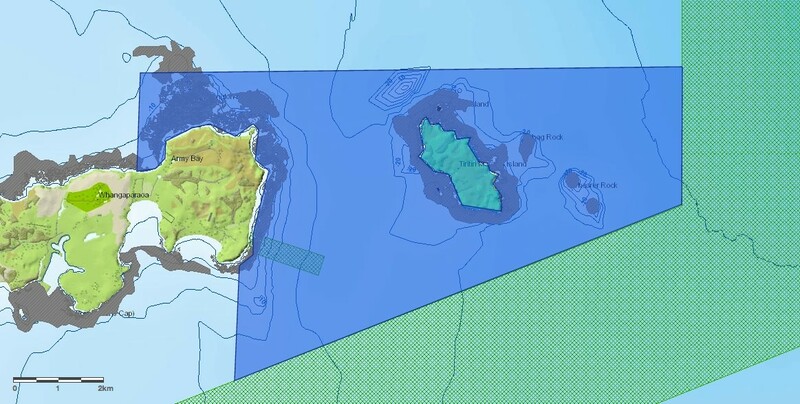 The suggestion is for the western shore of the island, that straight section from just north of the boulder bank near the Ranger’s station, for approximately 3.5 km northward, could then extend westward to join up with the cable protection zone running north through the central Hauraki Gulf approximately 4 kilometres west of the island and thus maximize the potential for this small reserve. The proposal would include the boulder beach on the shore, and the boulder bank sloping quickly down to shelly sand including part of the scallop bed, and reaching more than 50 metres depth before the cable zone. The boulder slope is ideal crayfish habitat which would allow recovery of this heavily exploited species. Although the suggested reserve is small, it encompasses the same length of coastline that has shown successful crayfish recovery at Tawharanui Marine Reserve. It would encompass a relatively small proportion of a major scallop bed, which should be represented in the MPA network. Strong currents through the Colville Channel create a current-swept benthic habitat with high-biodiversity coarse sediment substrates, and several deep rocky reefs. These reefs are no doubt rich in sponge life and this habitat should be represented in the MPA network. Including the north end of Jackson Bay ensures easy access from the shore, and an area for snorkeling safe from the fierce currents in the rest of the proposed MPA. A variety of coastal habitats are included – bays, open rocky coast, small islets and reefs. Google Earth images show extensive kina barrens on parts of the coast so there is no doubt fishing has compromised the shallow reef habitats in this area. With only one marine reserve on the Coromandel east coast (Hahei, or Cathedral Cove) there is a need for at least a replicate for Hahei, and representation of many more habitats. New Chums Beach includes a sandy beach, rocky headlands, and rugged open rocky coast with numerous small embayments. Inclusion of the northern end of Whangapoua Beach would provide easy access for snorkelers, and the small island just off the beach would be extremely popular. Unfortunately the estuary opening at the northern end of Whangapoua Beach has been severely compromised by grazing to the water’s edge and removal of most of the natural salt marsh habitat and is probably not worth including as prospects of recovery look unlikely. An MPA running from near the middle of Whangapoua Beach to the eastern headland of Kennedy Bay encompasses about the minimum desirable amount of coastline for a no-take MPA. A good offshore buffer well out on to the sandy seafloor would be desirable to protect crayfish wandering offshore in search of shellfish. The area overlaps with an indicative location of commercial scallop beds but is a very small proportion of the area and the commercial beds are unlikely to extend so close inshore as indicated. 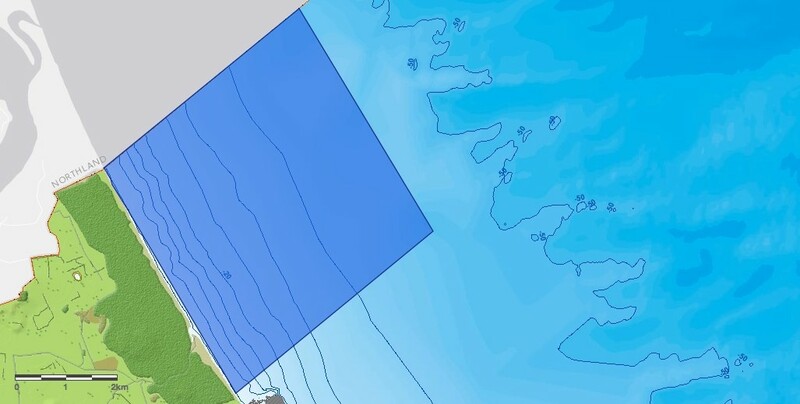 Even if there are scallops in the outer part of the suggested MPA, it is good to have a replicate bed for that included in the proposed Hauturu West MPA. 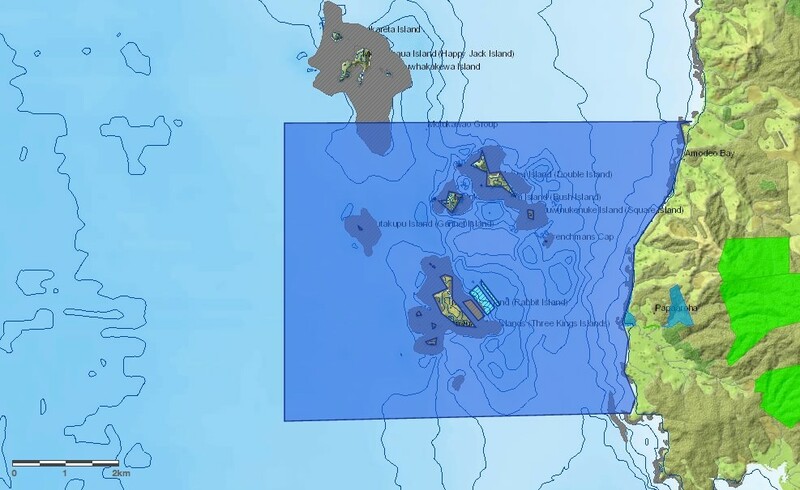 There is a need for a large no-take marine reserve in this area to continue the connectivity opportunities particularly for biodiversity of deep reef systems as in the proposed Eastern Great Barrier (Aotea) MPA. A large MPA here would capture the great diversity provided by a multitude of islands and shallow reefs, and a deep-water reef system extending well offshore to the east to at least 150 metres depth. Although this area is a popular fishing ground, there is ample room for a large MPA as well as for continuing fishing activities. All habitats included in the proposed MPA are well-represented in nearby areas accessible for fishing. The high conservation status of the small islands included enhances the ecological connectivity opportunities between the sea and the land. Extending the MPA to the edge of the HGMP includes waters beyond 200 metres deep, rare within the HGMP. Including part of the southern shore of Great Mercury Island provides a couple of sandy beaches where boating families could enjoy sheltered snorkeling opportunities. There is enough open water area to allow recovery of snapper, trevally and perhaps kingfish populations, and the deep reefs could enhance chances of hapuku recovery. Consideration could be given to an extension eastward of the reserve boundary to improve access. Currently the main access is from a carpark on a headland west of the beach, down a long winding walking track to Cathedral Cove. This precludes the carrying of more than basic snorkeling gear. Better shore access from Hahei Beach to reefs if protected at the east end of the beach would greatly improve public access to the benefits of the marine reserve. This was part of the original proposal but never presented to the Minister of Conservation. (Not mapped, but the area in question is visible at the right of the map of Purangi Estuary below). This small estuary on the southern side of Mercury Bay, just around the corner from Hahei (Cathedral Cove) Marine Reserve, is surprisingly intact from an ecological point of view. Saltmarsh and mangrove areas are extensive, and much of the native bush cover remains along the flanks of the estuary. There are a few places where salt marsh has been drained and stock appears to have access down to the shore. The estuary itself has clean sand flats and is likely to retain high biodiversity values. Such high quality estuaries are now hard to find in the HGMP. A typical stretch of Coromandel east coast rocky shore, the proposal stretches from Te Karo Bay in the south where there is the only road access, and continues north about 5 kilometres to about half way between Boat Harbour and Hot Water Beach. Most of the shore is backed by bush. There are two sandy beaches in the south of the area accessible to land-based visitors, and a few small islets and reefs close inshore. Shallow reefs drop to sand fairly quickly offshore. The outer part of the MPA captures a representative example of several moderately deep (about 50 metres) rocky reefs scattered along this coast. Google Earth images suggest kina barrens are common on some of the shallow reefs. The southern end of Slipper Island and the smaller islets of Penguin and Rabbit to the south include an impressive variety of biodiversity. A large subtidal seagrass bed is present in the bay at the southwest of Slipper Island. Penguin and Rabbit Islands retain natural bush and are used by nesting seabirds. Exposed rocky reefs in the east contrast with sheltered rocky shores on the west of the islands. Fine sandy sediments west of Slipper Island contrast with coarse shelly sediments in the channels between the islands. A biological survey described the mosaic of benthic communities west of Slipper Island (Grace and Whitten, 1974). Another small estuary in moderate shape ecologically. Saltmarsh areas and shoreline vegetation have been somewhat compromised by clearance and drainage but parts are still in reasonable condition and restoration efforts could improve matters considerably. Fairly large areas of mangrove forest appear in good shape. There may be some seagrass beds present but local knowledge would be needed to confirm. A short section of coast immediately north and south of the estuary entrance, and the small island (Hikinui) just off the entrance, should be included in the MPA to ensure safe passage into and out of the estuary for fish. Another “stepping stone” in the network of deep-water and offshore island MPA’s down the eastern side of the HGMP to maintain connectivity for deep water reef fauna, and to provide opportunities for recovery of pelagic fish and hapuku. Although a popular fishing area, the Alderman Islands and surrounding reefs are sufficiently extensive to accommodate both a large no-take MPA and maintain plenty of opportunities for fishing. From a biodiversity point of view the northern half of the island group is probably the most valuable in that there are many small islands and reefs providing extensive shallow rocky reef habitats. These are also most popular for fishing and diving, however, and it may be better to have the MPA in the southern part of the island group and extending to the deep water reefs well offshore. The proximity of very deep water to the east presents an opportunity to create an MPA encompassing waters in excess of 200 metres depth, as the only available replicate of the 200m+ depth at the eastern boundary of the proposed Eastern Mercury Islands MPA. 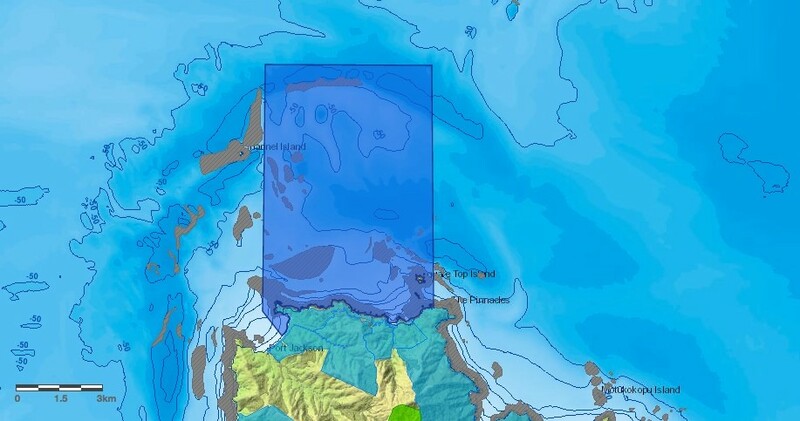 I believe this MPA should extend beyond the boundary of the HGMP in this area and continue out to the edge of the Territorial Sea at 12 nautical miles where depths approaching 1000 metres uniquely occur close to the HGMP. 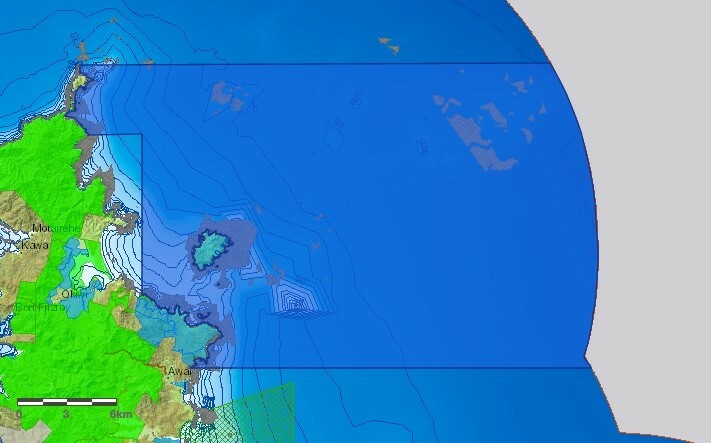 Due to limits imposed by Seasketch this MPA is mapped only to the edge of the HGMP. These may include areas where bottom-impacting fishing methods are excluded, such as trawling and dredging, set-netting, or commercial fishing per se. Customary areas such as Mataitai, Taiapure, and Rahui also come under the Type 2 MPA umbrella. The purpose and specific restrictions would be defined for each area and would not necessarily include biodiversity protection. Requirements for management input are likely to be much greater than for no-take Type 1 MPAs because monitoring and feedback would be required to assess the effectiveness of controls imposed, and adjustment if perceived goals are not met. It may be that some of the benthic protection areas may not need to be imposed if for example recreational dredging for scallops and mussels becomes a generally prohibited activity because of its proven damage to benthic habitats. Apart from the proposed no-fishing zone around Horseshoe Island, the remainder of the northern part of the Harbour should be subject to a Community Fisheries Plan or a Mataitai in collaboration with Ngati Manuhiri. Shellfish resources will come under severe pressure once the current harvesting ban is lifted in March 2016, partly because most other cockle beds in the Auckland Region are either seriously depleted, polluted, or closed to harvest. Whangateau has for many years held the best cockle resource in the Auckland Region. There are other fisheries issues in the Harbour which should be more closely controlled than under the normal blanket fisheries controls applicable everywhere. Future benthic protection zone prohibiting dredging, to allow for restoration projects to re-establish green-lipped mussel beds to improve water quality and improve benthic habitat. Ngati Whatua have begun a mussel restoration project in Okahu Bay. 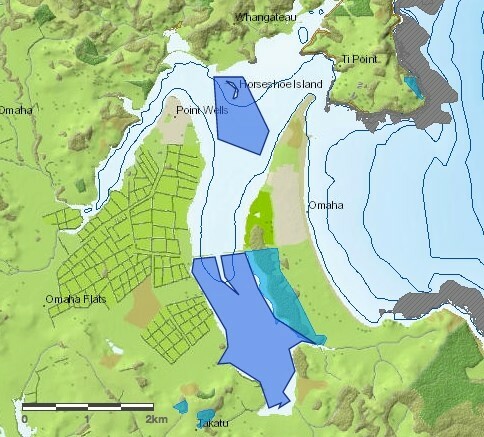 Several possible future benthic protection zones prohibiting dredging, as above.Active restoration, and encouragement of natural regeneration of once-extensive historic green lipped mussel beds is a project currently underway by the Revive our Gulf group, started in the Rotoroa Island area. Aim is to improve the benthic habitat for biodiversity and as a fish nursery, and to improve water quality because of the filtering capacity of many millions of mussels. Boundaries of areas to evolve as the scope of the project develops. Several large future benthic protection zones prohibiting dredging, as above. Boundaries of areas to evolve as the scope of the mussel restoration project develops. A benthic protection area to prohibit dredging and trawling, extending northwest from the edge of the present commercial scallop bed. Moderate currents and coarse sediments provide a benthic habitat of high biodiversity value not well-represented in proposed MPAs elsewhere. In the 2003 northeast Aotea marine reserve proposal, the Whangapoua Estuary, the bay south of Waikaro Point and the rocky coastline north of Waikaro Point was a matter of sufficient concern for the Minister of Fisheries to turn down the marine reserve application. It is now intended to suggest that this inshore zone be put forward as a Type 2 MPA, specifically a Mataitai to allow local iwi to manage this area for sustainable customary and recreational fisheries purposes. 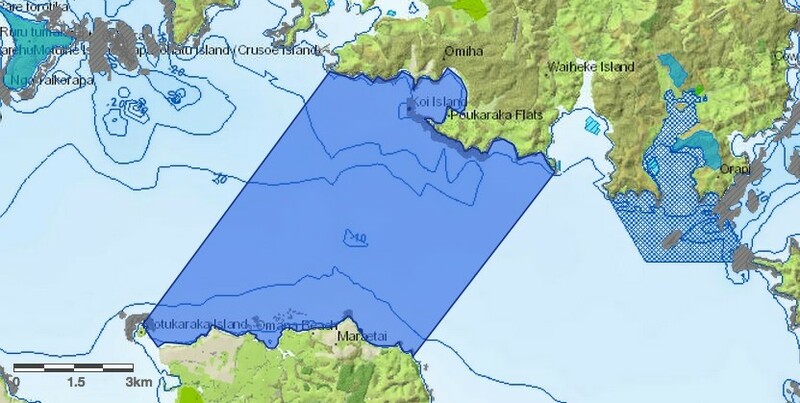 In the long term this area would benefit greatly from the adjacent presence of a large marine reserve, but the mataitai would give some local control over access to improving fisheries in the zone and could prevent uncontrolled attraction of fishers to the area as fish stocks build. A “lolly scramble” effect should be avoided. We have lots of wonderful science. We have habitat maps, maps of fish distributions, fishing effort, ecological services, productivity, seabird and marine mammal use, currents, aquaculture, historic mussel beds, sediments, gap analysis, shipping movements etc. etc. We have detailed analysis of prioritisation of areas valuable for biodiversity conservation. We have lists of criteria and design principles for networks of MPAs. We have lots of science from our existing marine reserves, and comparing marine reserves to fished areas, which has given us an understanding of the many values of MPAs. We know the much greater value of no-take versus partial protection for recovery and survival of large, old fish which have a critical role in maintaining ecosystem services and a healthy ecology. We know larval spillover from reserves into adjacent fished areas can be significant. We know degraded kina barrens revert to healthy kelp forests if we stop fishing, but they don’t if we simply kick out commercial fishing. We can always seek more science and more analysis of what information we have. A lot more analysis of the areas proposed can be gleaned from Seasketch including the proportion of each habitat represented in each area, and how this relates to overall goals for the MPA network. An analysis in MARXAN could also be useful. Science will always want more information. But the science alone has not yet come up with a draft network of marine protected areas. Based purely on the science, any draft network is likely to be extremely complicated, with strange shapes of areas trying to accommodate the “best” result to represent and replicate all the complications of marine habitats and biodiversity values. It is time to take the available science onboard and to have faith to make the next step toward the social responsibility needed to make some lines on maps based on all the science, but importantly tempered by the less-tangible social and cultural backgrounds, values of mana whenua and kaitiakitanga, and aspirations of all the people involved in the Gulf. We all have different ideas on how best to achieve the common goals of the Marine Spatial Planning process. So far we have only six no-take marine reserves covering a pathetic 0.3% of the area of the HGMP. Although we have learned a lot from those few MPAs, we all know this is woefully inadequate going forward to arrest biodiversity declines more broadly in the Gulf. It is imperative that we make good progress on a network of MPAs in this Marine Spatial Plan process, and that we come up with at least a draft MPA design we can learn to live with. The danger is that if we don’t get a spatially adequate network design for MPAs into this Marine Spatial Plan, all the space will be allocated to other purposes and in future it will be even harder to get any more MPAs in place. We have been bombarded with information from many experts in recent months. It is now up to the members of the Stakeholder Working Group, guided by the probably conflicting recommendations of the various Round Tables, to filter and assimilate all the information, and to blend all this into a common tangible result which will carry us forward to an improving Hauraki Gulf. There have to be some radical changes if we are to see a halting of environmental degradation, and to turn that around toward substantial improvement. An effective, comprehensive network of fully protected MPAs is an essential part of those changes. Marine reserves are no longer just for science. They are critical to the future survival of a healthy Gulf. Business as usual simply isn’t going to make the grade. Recommendations in the Marine Spatial Plan will have no statutory status. The intention is for those recommendations to inform future statutory processes to be carried out by various agencies to implement the plan. Any recommendations in the plan regarding Marine Protected Areas will ultimately form a basis for discussion in a future MPA Forum yet to be initiated under the Marine Protected Areas policy and implementation plan (DOC and Ministry of Fisheries 2005). When such an MPA Forum will be established is unknown, but it would make sense to establish this imminently as we currently have a lot of the people who could make up that Forum already involved with the MSP process at either SWG or Round Table levels, and already largely “up to speed” with the necessary understanding of the intricacies of an effective network of MPAs. One of the recommendations in the Marine Spatial Plan could be to establish an MPA Forum for this area as soon as possible. Ballantine, W.J. 2014 Fifty years on: lessons from marine reserves in New Zealand and principles for a world-wide network. Biological Conservation 176:297-307. Chiaroni, L., Hewitt, J.E. and Hancock, N. 2008 Benthic marine habitats and communities of Kawau Bay. NIWA Client Report HAM2007-123. Auckland Regional Council Technical Report 2008/006. 69pp. DOC. 2000 New Zealand Biodiversity Strategy. Department of Conservation, Wellington. DOC. 2003 A marine reserve for Great Barrier Island? Your chance to have a say. Department of Conservation, Auckland Conservancy, January 2003. DOC and Ministry of Fisheries. 2005 Marine protected areas policy and implementation plan. Department of Conservation and Ministry of Fisheries, Wellington. 24pp. Grace, R.V. 2014 Why do we need no-take zones for Marine Spatial Plan? Presentation to Biodiversity and Biosecurity Round Table, Marine Spatial Plan. September 2014, 6MB PDF. Grace, R.V. and Whitten, R.F. 1974 Benthic communities west of Slipper Island, north-eastern New Zealand. Tane 20:4-20. HGF. 2011 State of our Gulf 2011. Hauraki Gulf Forum, Auckland, September 2011. HGF. 2014 State of our Gulf 2014. Hauraki Gulf Forum, Auckland, September 2014. Jackson, S.E. 2014 Prioritisation of areas in the Hauraki Gulf Marine Park for biodiversity conservation. MSc thesis, University of Auckland, 2014. Kerr, V.C. and Grace, R.V. 2013 Subtidal and intertidal habitats of the north coast of Waiheke Island, Hauraki Gulf. Report for Friends of the Hauraki Gulf, Hauraki Gulf Conservation Trust, and Forest and Bird Hauraki Branch, November 2013. NZUA. 2002 Tiritiri Matangi marine reserve. Draft proposal for public discussion. New Zealand Underwater Association, December 2002. Thomas, H.L. and Shears, N. 2013 Marine Protected Areas: A comparison of approaches. For The Royal Forest and Bird Protection Society of New Zealand, Wellington, New Zealand. WHCG. 2009 Whangateau Harbour 10-point protection plan. Brochure published by Whangateau HarbourCare Group, Whangateau. 2009. Wow great work Roger, that is a comprehensive, that would be great if we can get all those regions suggested into marine reserves, including extending the Leigh Marine Reserve. Yes. Would be wonderful. The Marine Spatial Plan is deliberating of this and lots of other things at present. They have delayed the release of their plan for several months coz they need more time. This may be a good thing, but I am still skeptical that we will get a proper network of no-take marine reserves. Time will tell. Hey, great work Roger. We pretty much know where MPAs should be created and with your work, what are the reasons they are not created now? I suggest establish them now according to the SeaSketch maps, and then any tweaking can come later. As we all know, there is a lopsided approach with conservation and protection in NZ with the emphasis on terrestrial with the detriment of marine. With biodiversity decline in the marine environment gathering pace, the time for action is now. Create the MPAs now and the bureaucratic wrangling come later. Mark, I wish it was that simple! I agree with your sentiments but it is all a MUCH more complicated process than that. Whatever is recommended by the Marine Spatial Plan, that is just the beginning. Any further marine protection would have to go through a MPA Forum process administered by DOC and MPI, as is occurring presently in the SE Otago area. But a new MPA bill is being prepared, and DOC has indicated that no new marine reserves will be processed until that new Bill is passed into law. When will that be? We have been waiting now for about 12 years for new Marine Protection legislation. There is supposed to be a Public Discussion document on it coming out imminently, but I understand there is now wrangling within Government as to whether it should include our seas out to the 200-mile limit of the EEZ. So unfortunately not a lot is likely to happen in a hurry, despite the urgent need that you and I see. I applaude the effort you have gone to and even congratulate the honesty of disclosing the reserve network desired finally. When will you realise this is a shared resource and country. When will you truly engage with the other stakeholders such as iwi and recreational anglers instead of creating division and alienating yourself from the very people you need support from. WHEN will you join forces with legasea to use your skills to attack the QMS that plainly tears our fisheries apart while a few fat cats get rich and individual commercial fisherman feel forced to break the rules. Fishing for kaimoana in nz is a birthright unless you choose to work with everyone you will continue to meet resistance. Some of your ideas have merit but other areas fail to consider geographic challenges. If you place a reserve at tiri indicated the distance from the only safe ramps to fish is bloody dangerous. I highly recommend meeting with legasea to discuss a joint strategy so we all get what we want. Your skills there reach change the rules and join a team. Totally agree Marty, well said. Eastern Great Barrier Island (Northeast Aotea) 51.383.8ha Re: Draft discussion document. Dear Roger Grace, i would like to allude you to the DRAFT discussion document that says “the local iwi were apparently unwilling to give up the coastal fisheries from the needles to Waikaro point opposite Rakitu Island. This proposal suggests a Mataitai reserve along the shore from south of the shore to Harataonga Bay”.This is entirely incorrect.It was actually one of our kaumatua that expressed his concern and sadness that his food bowl was about to be taken away from him, which suggests someone changed what he actually said to suit their own agenda and at the expense of our kaumatua.That is unacceptable. I know this because i was there. Also, to suggest that a Mataitai reserve “lolly scamble” of 2675.3 for the local iwi to control is nothing but an insult. Ngati wai/Ngati rehua ki Aotea Haukainga iwi katoa were 100% opposed to the 51.383.8ha marine reserve in its entirety.We also had to take into consideration the groundswell of opposition from the entire Aotea community who live there,and they said NO as well.The former minister of energy Gerry Brownlee was told NO to the exploitive mining for gold.Again, the Aotea community said NO. I am not entirely against marine protection, but a no-take marine reserve of 51.383.8ha is a big fat NO. A Mataitai proposed reserve of the entire 51.383.8ha would be the best decision for ALL concerned in my view. Against TYPE1 Reserves (No take) in popular coastal recreational areas such as Mahurangi reserve, as it impacts the livelihoods and lifestyles of residents that have been there for generations. Yes to TYPE1 reserves on offshore islands, for example the little barrier suggestion, there is minimal impact to people and the water quality is great for attracting tourists. Coastal water quality is generally poor in the inner gulf (such as mahurangi), make these TYPE 2 Reserves. Regarding TYPE2 Reserves (recreational marine parks). Totally agree on this, the ocean in recreational areas belong to the people, and should be protected from the industrial commercial bottom trawling machine. Would be pleased to see the hauraki gulf become a recreational marine park. Its the industrial scale operations that is responsible for destroying the hauraki gulfs natural habitat, and continue to restrict the re-building of marine life. For example the whole of the hauraki gulf was once a gigantic shellfish bed, providing natural habitat and food for all fish to breed and grow. Now the majority of the gulf is mud, with only a tiny fraction of shellfish beds left. What caused this? Only one thing, the introduction of the bottom trawling machine. At the same time as ripping the seabed to shreds, the bottom trawl machine was removing 100,000+ ton per year of snapper for 20 years straight during the 1960’s and 1970’s. To put this in perspective, that’s 2,000,000,000 kg or 2 billion snapper (at an average weight of 1kg). And that’s only snapper. Luckily bottom trawling is now restricted to 4000 ton per year. But the fish stocks are still not improving a great deal. If you talk to any Marine Biologist studying this, the fish stocks will not significantly improve unless we give the seabed a chance to restore itself. Obviously recreational’s capacity to restore the hauraki gulfs seabed is minimal, so taking away local residents rights doesnt stack up. Especially those families that have been fishing their for generations. YES to more TYPE2 reserves (recreational marine parks) and YES to more TYPE1 reserves on offshore islands. NO to type 1 reserves that interfere with local residents lifestyles! This is really just sentimental twaddle, with no scientific or evidence based fact to substantiate the many claims. Stuff like Hapuka used to be caught around Tiri Tiri 70 years ago and banning everything would make it great for snorkelling for young families. I mean please. You clearly have an agenda of look but don’t take, but if you want to be taken remotely seriously at least have some science to back it up. Jollo, there was a photograph published in the Rodney Times some years ago of an old guy on the beach at Orewa in 1945. He had about a 14ft clinker dinghy and had been fishing at Tiritiri for the day. He had 5 large hapuku, their heads and tails hanging over the gunwales of the dinghy. There is no water at Tiritiri deeper than about 30 metres. We now think of hapuku as a deepwater fish, because you now need to go to 100 metres plus to catch them. And large ones are rare. There is plenty of science to back up this document in the several references given at the end if you care to read them. And remember this document is a DRAFT to kick off a discussion. I would like to hear some informed discussion please. I realise this is a long shot but do you have access to the GIS shapefiles used in these images? Of course I had to have access to the GIS system to create those maps in Seasketch, but I struggled and needed a lot of help to get them to this state. I am not expert enough to help with your question, but others intimately involved with the production of the Marine Spatial Plan should be able to help.